Fully featured and ready to take control. An AV receiver is a product that should never be put in the backseat of decisions when looking at a home theater system. A lot of people that I’ve talked to in a retail setting feel that it’s better to have higher end speakers rather than put money into a good quality receiver. The problem with this is that while most speakers will generally sound similar (within respected quality groups), having a good receiver will power them properly and provide sufficient inputs for all your gear. I’ve had a few situations where people have cut costs and then came back later needing an HDMI switch or different audio solutions. Before the V673, I owned the Yamaha HTR-6250. 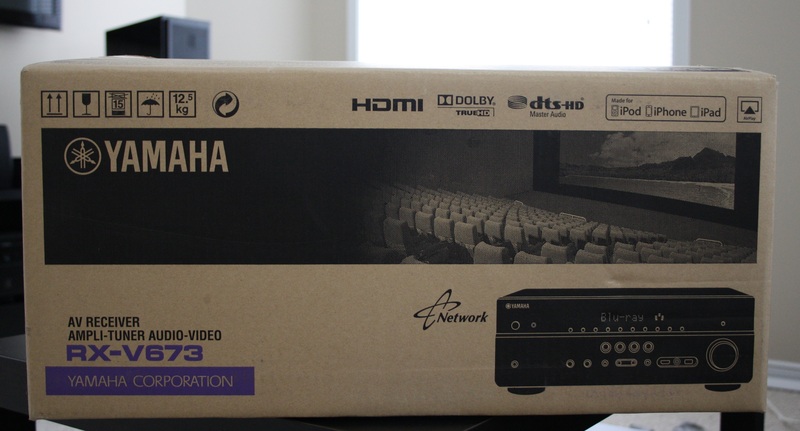 It was my first HDMI receiver and I really enjoyed having it. Never gave me any problems, and provided an adequate amount of inputs for what I had at the time. About 2 years into owning it I decided that I was going to need a little bit more, as it didn’t have any networking functionality or 3D pass through. Being involved in the industry at the time, I knew that new models were just a short few months away so I held out. When it finally arrived I picked it up and took it home to get set up. I compared a lot of the major brands, taking things like functionality and features versus price into consideration and the Yamaha came out on top. The V673 is one of their higher end models in the consumer line, and for the system I had at the time I didn’t see it necessary to warrant the jump in cost for the next model up. An input for everything you need. The V673 comes loaded with 6 (5 rear/1 front) HDMI in, and 1 out. There’s also a USB port on the front to connect portable devices for music playback and displaying photo slideshows. Around the back you’ll find a bunch of legacy inputs (component, composite) as well as digital audio (optical, coax) and analog audio inputs. The main feature of the V673 are the speaker options. This receiver packs in 9.2 capability (dual-zoned into 7.1 or 7.2 for the main and 2.0 for the second) or the choice to have the main zone bi-amped. The speakers I had previously were set at 8 ohms, but the ones I upgraded to back in November of 2013 (which are reviewed here), I was able to bump it up to 6 ohm and bi-amp the front speakers. I currently have one sub woofer, but the ability to have a second is something I’ll be looking in to very soon. There’s currently 5 speakers (2 being bi-amped) along with a sub and even at very loud volumes the receiver never gets warm or cuts out. I was very impressed by the consistent levels of power it’s able to output over extended periods of time. The V673 also comes with the YPAO calibration microphone to perform an automatic set up of your speakers. It uses the speaker placement relative to distance from the microphone to calibrate the level of each speaker and make sure that you get an even sound from where you’re sitting. Stay connected, without any effort at all. The V673 has full networking functionality, allowing it to be controlled via the included remote or by any iOS or Android device. The V673 connects to a router via ethernet, and as long as your device is on the same network it’ll show up in the list of accessible devices. You can control almost every aspect of the receiver including input, DSP mode, volume, bass and treble levels, and zone control. This is a nice feature if you have a second zone in a separate area of the house, as you’re able to control the content and volume of that second zone anywhere within the Wi-fi network. Through the app you’re also able to connect to the receiver as a media server and play content locally from your music library on the device. A major feature and one of the main reasons why I waited on this model is the Airplay input. This allows any iOS device, as well as Macs connect to the receiver wirelessly and stream music. I use this feature frequently to stream radio stations via my iOS device, and to stream music from an iMac in another room of the house. A couple of other small features that Yamaha offers include: a very well designed on-screen user interface, customizable input labels, and the use of a decibel rating for volume opposed to an ascending value. You can even dim the brightness of the front LCD display. The remote also has a really nice look to it, and presents all the popular buttons in an easily accessible way. It also has the capability to additionally power on and off a TV using codes provided in the manual. With 3D and 4k support as well as all the additional features that the V673 provides, I can definitely see this receiver powering my home theater for a long time. *The RX-V673 is a 2012 model and has been discontinued. The current model is the RX-V675.